The Missouri Farm Bureau Foundation for Agriculture was established in 1996 to provide a dedicated funding source for various agricultural education and leadership programs. Supporting these efforts would not be made possible if it was not for the generosity of those believing in the Foundation’s cause. Thank you to every business and individual who has contributed to the Foundation’s efforts! We encourage anyone who wants to help ensure a strong agriculture is present for the next generation to consider a tax-deductible gift to the Missouri Farm Bureau Foundation for Agriculture. The Foundation provides resources in several different ways for young individuals seeking to expand their agricultural, mechanical, and leadership knowledge. The Foundation funds mini-grants to teacher for elementary school classroom projects. Teachers use this funding for creative twists on the theme of where our food comes from. Example projects include projects such as “Grow Your Own Pizza” and field trips to George Washington Carver National Monument. Missouri County Farm Bureaus can take advantage of up to $300 annually for local agricultural education and leadership development programs. County events supported over the past year include farm safety, commodity promotions, and presentations with the agriculture economic contribution study. 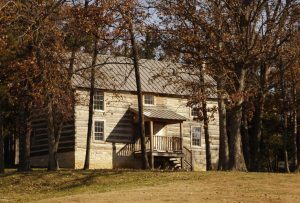 The unique log home is dedicated to telling the story and history of agriculture with historic artifacts, displays, and short videos describing agricultural life for inhabitants of a young Missouri. The home is located behind the Missouri Farm Bureau Center at the corner of Missouri Blvd. and South Country Club Drive (approximately 5.5 miles west of the State Capitol off Highway 50).